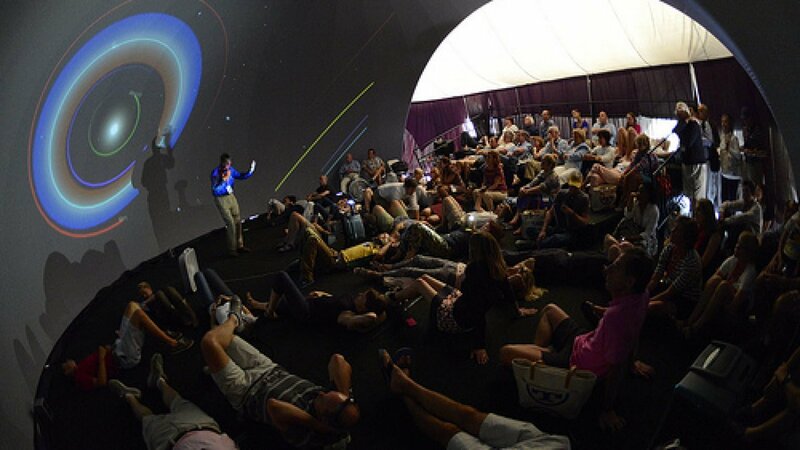 2016 is the third year we have worked with the WorldViews Network to transform a geodesic dome built by Buckminster Fuller into “The Eye” — a digital dome theater for the Aspen Ideas Festival. 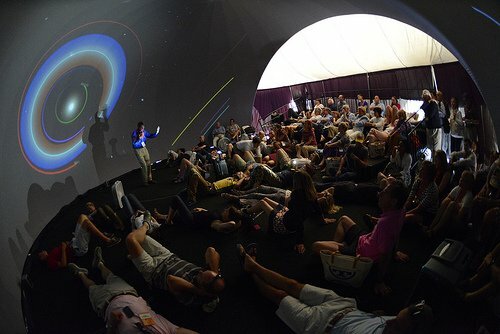 Over the course of the event, more than a thousand people experience an interactive exploration of the ways in which humans and Earth systems are linked. The Elumenati supplied an OmniFocus 30530 projection system (2560×1600 resolution at 7,500 lumens) and a custom-built, negative-pressure screen inside the geodesic. Our WorldViewer software drives the presentations, which incorporated underwater surveys of coral reefs from the Catlin Seaview Survey, satellite imagery, climate models, new observational technology from NGOs and citizen scientists, underwater videos, video productions from NOAA’s Climate Resilience Toolkit, and rendered programming from the California Academy of Sciences. WorldViewer makes it simple to incorporate a wide range of media into live presentations for maximum audience impact. The Aspen Institute launched its festival in 2005 as a means of engaging public dialogues on a diversity of complex issues that benefit from educational forums. In 2013, the Aspen Institute invited the Worldviews Network to put together programming in the Buckminster Fuller dome, which had been built in 1967. Fuller had envisioned in 1962 that people would use domes like this to visualize global data to gain situational awareness to guide spaceship Earth. We can honestly say we are realizing his vision. “We relied on software from the Elumenati (Worldviewer) to mash up Science on a Sphere content with imagery, video and music. Their platform-agnostic tool worked seamlessly in the dome and made it relatively simple to author not only the live, narrated shows we presented, but also displayed all of the autorun content. “Worldviews Network (originally funded by NOAA’s Office of Education) live programs are unique because we can seamlessly zoom from the edge of the observable universe to regions and watersheds. We talked a lot about federal efforts to coordinate research and decision-making, for instance by the North Atlantic Landscape Conservation Cooperative. For a global perspective on coral reef declines, we relied on images from the Catlin Seaview Survey. We were able to highlight some technology innovations by Global Fishing Watch (a technology collaboration among small and large tech companies focusing attention on illegal fishing); and we showed off citizen science efforts being coordinated and amplified by Cornell’s Ornithology Laboratory.